I was half way through a response and one of my dogs who likes to sleep under my desk bumped my computer power cable and my computer shut off. Grrr. We don't know what the mastaba was built into exactly as this in and of itself is speculation. 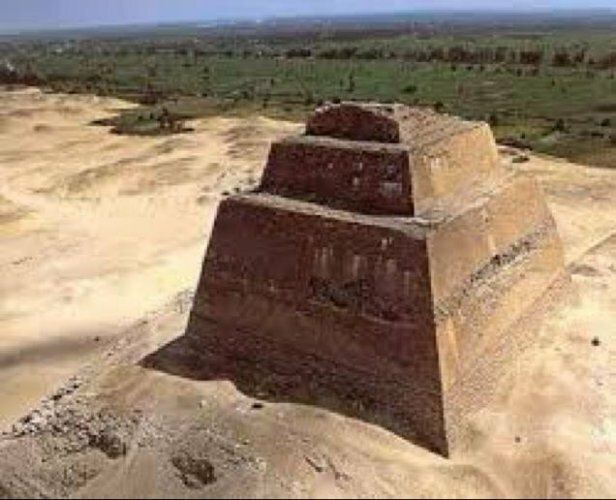 To test the theory as it applies to Saqqara first I have to ask is it even possible which it is. Until I go there and start taking it apart I have to leave it at that. > indication that they were NOT of the "core tower"
This is a reasonable concern and the fact is G1 and G2 would be some kind of variation to this theme as they were built incorporating bedrock formations which we know began as courses. But as I said, G3 and every other non-ruined exposed large pyrmaid shows some form of tower/stepped core and G1 it has been argued by some was built around a stepped core which the gravimetric scan gives further credence to this. > being severely eroded and/or pilfered. We can clearly see a tower core in G1b (middle). There is no way if built in horizontal rows that what is left over would be a nice tidy tower core. To compare this to the pyramid to the right it seems quite clear to me the other "steps" were later added around the core then the sloping layer of the true pyrmaid added to that. This is the progression of pyramid building that I see again and again. Meidum's tower core has "steps" as well which at the very least would have been the first foundational "step", the tower, then the top step or two. I see. As I say above this seems quite clear. > from a slightly different viewpoint? Again, the idea of G3 having a stepped core is not unique to me. > physical evidence in each pyramid. What we can directly observe is that the outer pyramid layer was added to a stepped core. Optimism is not required, just eyeballs. All I have added to this fact is the idea that a tower was built first, which like Medium also has steps, and that any lower levels of steps were added after to facilitate the structural integrity and construction of the true pyramid outer layer. > adaption (or even adoption) culture. As I have argued before, I do not agree with this and suggest there was an original core structure at G3 that was later converted to a pyramid.